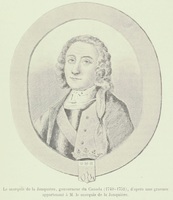 MARIN DE LA MALGUE (La Marque), PAUL, officer in the colonial regular troops; baptized 19 March 1692 at Montreal, eldest son of Charles Paul de Marin* de La Malgue and Catherine Niquet; d. 29 Oct. 1753. 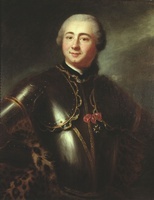 Paul Marin de La Malgue, son of an officer in the colonial regular troops, married Marie Joseph Guyon Desprez on 21 March 1718, at Montreal. Several children were born of the marriage, including a son Joseph* who had a military career. In 1720 Marin was serving in the west where he was to spend most of his life. 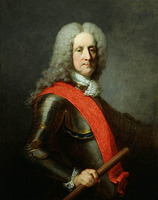 He was commissioned an ensign in the colonial regular troops on 26 May 1722. That year he was given command of Chagouamigon (near Ashland, Wis.), with the customary monopoly of the region’s fur trade to defray the expenses of maintaining the post. His chief responsibility was to retain the Indian nations in the French interest, and at peace with one another. 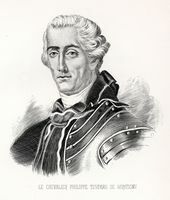 He earned the confidence of Governor General Philippe de Rigaud* de Vaudreuil, and of his successor, Charles de Beauharnois, who declared that Marin was feared and respected by the Indians and always ready to risk his life for the French cause. After serving as first ensign for seven years he was promoted lieutenant in 1741. The minister of Marine, however, had informants who persuaded him that Marin was a poor officer, more interested in fur trade profits than in maintaining the Sioux, Fox, and Sauk tribes at peace. He therefore ordered him recalled. Beauharnois took it upon himself to disregard that order. He explained, in 1741, that Marin had succeeded in pacifying the warring tribes and had persuaded delegates from the Sioux and five other nations to accompany him to Quebec to ratify a general peace settlement, and that the king’s interest required he be kept at the Sioux post. Two years later Marin crossed to France on family business, returning to Canada at the onset of King George’s War. 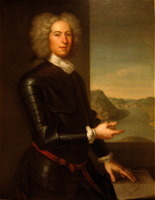 He campaigned in Acadia and on the New York frontier. 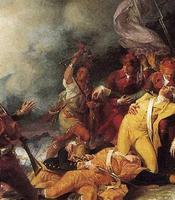 In 1746 he commanded the war party that destroyed Saratoga (Schuylerville, N.Y.) and ravaged the outlying settlements. In these campaigns he gained a reputation for bravery and ruthlessness. In 1748 he was promoted captain. At the termination of hostilities he was sent back to the west to command at Baie-des-Puants (Green Bay, Wis.), the most lucrative of all the western posts and the one most eagerly sought after by officers of the colonial regular troops. He appears to have made the best of his opportunities. During his previous command in the west, down to 1738 he had employed not more than six voyageurs each year to transport goods to his post; in 1739 he engaged 11, in 1740 23, in 1741 29, and in 1742 31, but for the years 1750–52 he engaged at least 190. He may well have made considerable profits, but the high costs of the trade and the limitations of the market make it unlikely they were as astronomical as unsubstantiated rumours claimed. In his defence it could be said that it was a fundamental aim of French policy to retain the allegiance of the western nations and prevent their having dealings with the Anglo-Americans. This required that the French supply them with the goods they demanded and accept their furs in exchange. If the exchange could be done at a profit, so much the better. 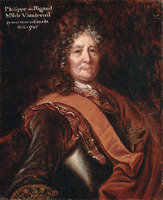 Since the political aim was achieved, the king’s service clearly did not suffer during Marin’s tenure at Baie-des-Puants. Significantly, when Governor Duquesne*, immediately upon his arrival at Quebec in 1752, decided to dispatch a large force of troops and militia the following year to wrest control of the Ohio valley from the Americans, he chose Marin to command it. Marin’s orders were to establish a fortified post on the south shore of Lake Erie, construct a road to the head-waters of the Allegheny River, make the Rivière au Bœuf (French Creek) navigable, then establish a chain of forts to the Ohio River, and garrison them. Marin, now 61 years old, drove himself and his 1,500 men unmercifully all through the summer and fall of 1753. He allowed nothing to stand in his way. Junior officers who showed a lack of zeal for the task were threatened with instant dismissal from the service. When the Iroquois protested the invasion of their lands they were bluntly told that if they opposed it they would be crushed [see Tanaghrisson]. American fur-traders caught in the region were sent to Montreal in chains as a warning to others. Hundreds of the Canadian labour force sickened from poor food and over exertion; many of them perished and the wraith-like appearance of those who survived made Duquesne blanch when they arrived back at Montreal. Marin himself fell sick and, although instructed to return to convalesce, he refused. In September Duquesne sent him the cross of Saint Louis, awarded in that year’s honours list. It arrived too late. Marin died on 29 October at Fort de la Rivière au Bœuf (Waterford, Pa.). He had deliberately chosen to die on active service rather than relinquish his command. AN, Col., C11A, 71, p.35; 77, pp. 102, 113–14; D2C, 47, pp. 12, 17, 402; 48, pp.39, 70; 49, pp.257, 320, 326 (PAC transcripts). “Journal de Marin, fils, 1753–1754,” Antoine Champagne, édit., APQ Rapport, 1960–61, 240–41. Mémoires sur le Canada, depuis 1749 jusqu’à 1760. Papiers Contrecœur (Grenier). Fauteux, Les chevaliers de Saint-Louis, 154. Massicotte, “Répertoire des engagements pour l’Ouest,” APQ Rapport, 1929–30; 1930–31. Stanley, New France. Régis Roy, “Les capitaines de Marin, sieurs de la Malgue, chevaliers de Saint-Louis, officiers canadiens, etc., en la Nouvelle-France, de 1680 à 1762,” RSCT, 2nd ser., X (1904), sect.i, 25–34. W. J. Eccles, “MARIN DE LA MALGUE, PAUL,” in Dictionary of Canadian Biography, vol. 3, University of Toronto/Université Laval, 2003–, accessed April 20, 2019, http://www.biographi.ca/en/bio/marin_de_la_malgue_paul_3E.html.